Members of the technology infrastructure workgroup meet. Clockwise from left, Greg Karst, Ph.D., Michael Ash, M.D., Teresa Cochran, D.P.T., Ben Stobbe and Emily McElroy. UNMC plans to be a fully digital campus by 2023. 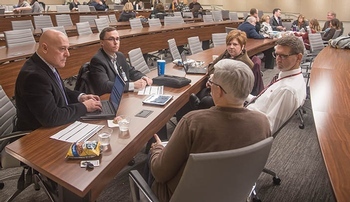 Sounds lofty, but UNMC leaders are focused on defining and meeting their goal, which is to leverage the benefits of technology to maximize the ability of faculty, students and staff to effectively meet UNMC's missions. Campus leaders, faculty and staff from all UNMC campus sites held a retreat Nov. 26 to launch the strategic planning process for a digital campus initiative, which is spearheaded by Dele Davies, M.D., senior vice chancellor for academic affairs, and Melissa Diers, senior instructional designer, IT Academic Technologies. "Digital technology continues to evolve and impact how we learn and teach," Dr. Davies said. "As a result, we must strategically look at current and future digital technology trends, how they are interrelated, and how they might influence our IT strategy so that we continue to maximize technology's role in training the next generation of health professionals." Analytics (ensuring appropriate data are collected and analyzed to enhance faculty, student and staff experiences). In the next six months, each group will submit to Dr. Davies and the Education Council their recommendations for next steps. "During the past decade, there has been exponential growth of educational technologies which have the potential of impacting the future of teaching and learning," Diers said. "UNMC has great initiatives throughout campus; the Digital Campus Initiative has the potential to be the binding agent to form a holistic and unified impact." More information about the initiative is available here. Questions? Contact Diers, Dr. Davies or the workgroup leaders.